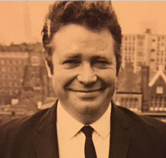 Former Sunday People diarist FRANK JEFFERY died last November. This obituary includes words of tribute from his son Mick. Frank Jeffery began his journalistic career after National Service, writing for local newspapers in Lewisham and Bromley. Never an ace newshound – especially if it meant missing lunch – his ease with words and ability to craft a perfect few paragraphs out of very little helped him progress quickly to Fleet Street. There he wrote gossip columns for the Daily Sketch, Daily Herald and Sunday People. As a diarist, he often had an invitation to a lunch-time product launch or a film screening to share, which always involved eating and drinking. This did his already generous waistline no good at all but made him very popular with his colleagues. Frank met his first wife Barbara, also a journalist, at a Labour Party conference. They had a son, Mick, and daughter Sarah. The couple later split but during the early 1980s he met and married Greta. Frank accepted a redundancy deal from Mirror Group in his early sixties but continued working freelance shifts. He also collaborated with friend and fellow People reporter Peter Bishop writing jokey novels, and churning out Mills and Boon romances, tongue firmly in cheek. He contributed to several trade magazines and tried, unsuccessfully, to write film and television scripts with Hilary Kingsley, who’d been his usual lunch companion on The People. Frank’s family adored him for his gentleness and wit, his expansive knowledge on so many topics and his brilliance with quizzes. They treasure the poems he wrote for them, and always for Greta on birthdays and anniversaries. He lived with a failing heart until his 89th birthday, just long enough to be wrong about Donald Trump’s chances of winning the presidency, his mind razor sharp and wry to the end.